Hi guys! Im sure you had tons of fun and exciting activities to do over the school holidays, and as for me, I would like to share with you on the activities that I've been doing earlier this month. Before I start, I would like to emphasize that I've never been to the Lost World of Tambun, and this happens to be my first time visiting this theme park, located in Ipoh. Despite is being at the theme park for the first time, I would have to say that the experience is very different than any theme park I've been to before. That's definitely a plus point, and if you're here to find out why, its time to scroll, scroll! Presenting to you the Lost World Of Tambun, I would have to say that I was super excited when I reached the main entrance. Instead of looking like a theme park, it felt like I was entering a mystical new world. The theme park is surrounded by limestones, and trust me, this would not be like any other theme park that you've been before. The theme park features a water park, an amusement park, the haunted chambers, the tiger valley, the world hippo kingdom, the tin valley, the hot spring & spa, the petting zoo, and so much more. There's really no point of me listing everything out here if I don't show you what im talking about. So let's get into details on what I managed to cover in a day. To start our theme park journey, first, I decided to explore the Lost World Amusement park which has a few playful rides that are indeed nostalgic. Not many theme parks that I know of still maintains these nostalgic rides, and it's nice to get a feel super old rides that are hard to find! This section particularly features the pirate ship, the swing ride, and the carousel. Go as many rounds as you heart contents and enjoy the whole experience of feeling young again as you scream your heart out. Once im all warmed up from the rides, next I decided to visit the Haunted Chambers which features Malaysian ghost that you have never seen with your own eyes before (even for me)! I don't find many haunted houses that feature specifically 'Malay' belief ghost but trust me, it was a fun 10-minute walk through the maze for just RM10/pax! If you want to experience being in a haunted house, this is a definite must visit. The smell, the sounds, and the atmosphere will definitely take you away from the world you think you have not left. The house has a storyline as you try to find out way out from an old house with a sad haunted story to tell. Making our way next to the Tiger Valley, I made a quick stop to ride Lupe's Adventure, a small roller coaster that takes you through the water park and the green scenery. I wouldn't say that this is extreme, but im sure that the little ones and even teenagers would enjoy this ride as it takes you up, down and around the green scenery of the Lost World Of Tambun. By the time we finished our ride, we quickly rushed to enjoy the Tiger and Friends show at the Tiger Valley at 3pm. Im actually impressed on how well the trainers here train their animals out of love. But the highlight of it all would be the Tigers in action as they show off their hunting skills during feeding time. Off to the Tin Valley! Walking further into the park, you'll find yourself exploring the tin valley where it will give you a super nostalgia feeling of the olden days. I managed to catch the Tin Story show at 3.30pm where the storyline shares a love story between a tin miner and the owner's son. If you womder how tin miners used to tin mines, you will find all your answers here. There is also a really nice Dulang Tea House within the Tin Mining area which great authentic nostalgic dishes at a reasonable price. Great for a tea break from all the exploration around the park. And meet these really friendly deer's who would let you pet them anytime! As you walk deeper into the park, you'll find your way to the Lost World Hippo Kingdom which features 2 really cute hyena's named Rosie and Hunky. Never in my life, I've seen really cute hyena's looking clean and really happy. I was told that this particular area is a new addition to the park which opened in December in 2017, so if you haven't been here to check out the latest park, its time to plan your visit! You'll also find deer's, crocodiles, flamingoes and a really happy hippo that would be more than happy to see you! Im not talking about boring old hippos that stays under the water, but the kind of hippo that would see you from under the water. Hehe. Have you ever seen clean happy tortoises? Kids would love to get their hands on these cute guinea pigs! I even got to see an exotic spynx for the first time. Walking along the route that has not been taken, I found myself at the entrance of the Petting Zoo! This is my first time here, and I was already amazed by how huge this petting zoo is featuring hamsters, guinea pigs, birds, chickens, tortoise, and raccoons, just to name a few! Yes, I said raccoons. Hehe. Exploring through the petting zoo, I find my spending a lot of my time feeding the raccoons! I've never been so up-close with a raccoon before, and trust me when the raccoons here would make you feel like you would want a pet raccoon of your own! I got myself a pack of raccoon kibbles to feed, and the minute I place my hand towards the raccoons, the raccoons would gently grab the food away from my hand. I was actually shocked to find out that raccoons have really soft paws, similar to a cat paw. Trust me, the raccoon's here are 100% overload cuteness! Get yourself the buffet set to enjoy unlimited supply of noodles and miso soup! The spicy udon noodles that taste pretty good for spicy lovers. By the time it got a little dark, I decided to head back to rest at the hotel to prep myself for dinner and a trip to the Lost World Hot Spring Night Park. For dinner, I decided to dine at the Onsen Noodle House where you'll find noodles that are really affordable, and delicious. There are ala-cart menu's available, but I decided to try their buffet menu at RM20/pax to experience a natural steamboat via the hot springs itself (don't worry, its filtered clean hot spring water) LOL! I've seen the Japanese done something similar before, but never have I thought that you can find this at Ipoh as well?! YAY! Looks like I've checked off another wish-list of eating noodles from natural hot spring water. As bizarre as you think it is, the food was pretty good! 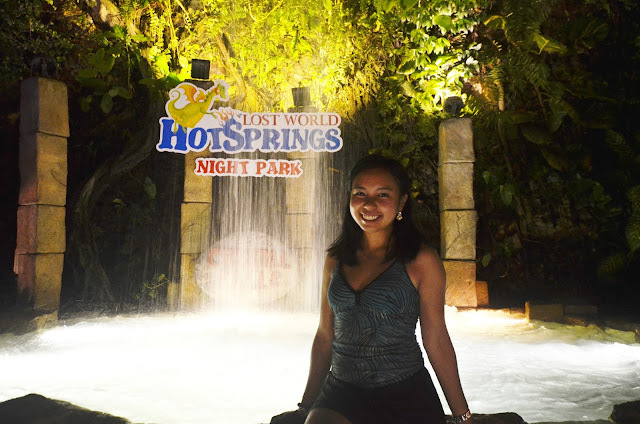 Before shooting off to the Lost World Hot Spring Night Park, I decided to explore the Luminous Forest which happens to be one of the Lost World Of Tambun's latest attractions! As I explored through the luminous forest, you'd be surprised to find neon lights that are insanely out of this world! It really gave me a whole avatar feel that I wished I dressed up for the visit, cause the location and decor are so Instagram-worthy! A great location to take pictures and show it off to your family back home. Hehe. Just launched in February, it's not a sight to be missed! And to end the night, a visit to the Lost World Hot Spring Night Park to complete my day. With over 6 pools and lagoons, the natural hot springs would surely spoil you with options. In case you're wondering, the weekday crowd was surprisingly okay, but if you're thinking about skipping the crowd, I'd suggest you go to the higher temperature pools to enjoy some moment of relaxation. According to Asian beliefs, hot springs are known to have natural healing benefits. So like, heal me hot springs. LOL. The best feeling about ending my day at the Hot Spring Park would be the minute you take another shower and head of to bed. Your body just feels amazing! If you're planning to trip to the Lost World of Tambun, I'd really suggest you stay at the Lost World Hotel as its just like 100 meters away from the theme park, totally walking distance. So in my case, actually spend my day at the theme park first, then off to bed. But if you want a more slow-paced day, you can opt to check-in and look forward to the hot springs first, then the day theme park the next day. It's really up to you, but personally speaking, staying at the Lost World Hotel would enhance your entire experience at the Lost World of Tambun. The convenience, the location, and the comfort are good enough to make your visit a memorable one. And there you have it! Holler if you want more deets cause, to be honest, I didn't want this post to be long. Y'all might not want to read it till the end. But if you did make your way till this sentence, I congratulate you for going this far. Hehe. Thank you so much for dropping by and I hope that this blog post was informative at least to those who are visiting the Lost World of Tambun for the first time. Will I come back? DEFINITELY! A day at the Lost World of Tambun is a perfect place to just be lost from the city. At the Lost World of Tambun, there's just so many things to do in just one location. Ever need a getaway that's not too far from Kuala Lumpur? Consider visiting Ipoh! Closed every Tuesday, except Public Holidays & School Holidays. Sekali je pernah datang sini. Makin banyak tarikan sekarang .. mana tau rezeki dapat pegi lagi..
Bestnyaaaa... Tak pernah pergi lagi the lost world of tambun ni. Menarik juga ya kat sini, Kak Sue belum pernah lagi datang sini walaupun orang Perak.. hehehe..
Lia pernah cuba mandi kat Hotspring je memang best. Pusing satu Lost World tak lagi. Nak pergi lah nanti nak explore kat sini.